Posted March 21st, 2018 by Cecile Sorra. So says Barbara Lee, a retired New York judge and an 18-year veteran of the Ignatian Volunteer Corps. And so says the evidence of her recent life. Exhibit A: She is 80 and has just released a book, God Isn’t Finished with Me Yet: Discovering the Spiritual Graces of Later Life. It’s her first book, one that uniquely focuses on applying Ignatian spirituality to issues specific to later life. Exhibit B: She is just beginning a new career as a spiritual director. She completed a two-year program at the Creighton University Graduate School of Theology and already has four clients. She even provides spiritual direction to one client via the video communications app, Skype. It has been a grace, she says, to write the book and to begin a new journey as a spiritual director. And it is a grace she attributes in large part to the Ignatian Volunteer Corps. Both the book and spiritual direction evolved out of the years of service with IVC. Volunteering mostly as an English-language teacher in New York, Lee says the work, the fellowship and reflection with Ignatian volunteers and the spiritual direction she received gradually led to a surprise call to become a spiritual director. “At first I said, ‘Who me?’” she recalls of her unfolding epiphany. Before retirement, she had been a woman trailblazer in the legal profession, one of 16 women who graduated Harvard Law in 1962. She worked as an attorney and eventually became a U.S. magistrate judge in New York — all at a time when few women were able, or willing, to buck the male-dominated legal domain. She was led to IVC through a neighbor and began teaching English mostly to Chinese immigrants. During her time with IVC, she marveled at the sheer variety of service work her fellow volunteers conducted. One spent late nights on a suicide hotline. Some visited immigrant detainees in imminent danger of deportation. Others worked with children or the homeless. “I was so impressed with the courage that people had to do some of these things, but I was also so impressed with the diversity of graces,” Lee says. Barbara Lee spent much of her time with IVC as an English-language teacher for Chinese immigrants in New York. She was also struck by the commitment they had as a group. “We were doing different things, but we were doing them out of the same spirit and we were sustained by sharing our spiritual journey,” she adds. It was in sharing prayer and the journey with IVC peers that brought her onto the path of spiritual direction and to Creighton in Omaha. Her unique perspective caught the attention of Loyola Press, whose editors encouraged her to expand her thoughts into a book. Her legal career made writing a requisite. “I thought it was thrilling, and I thought it was a grace,” she says. 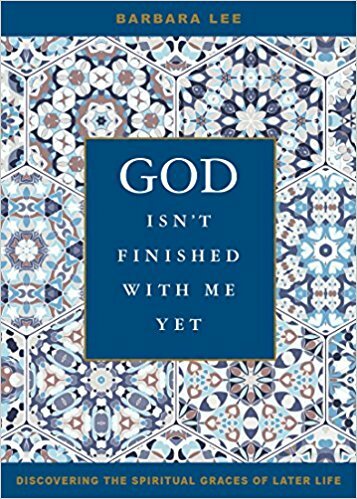 Lee begins God Isn’t Finished with Me Yet in much the same way as the original article. She addresses the marginalization of older adults in their parishes, her own personal journey as a woman in the legal field, and then the decisions she confronted in her retirement. In St. Ignatius’ Spiritual Exercises, which she made in 1979, she found a fountain of resources — and graces — for older people. She shares those resources in the 125 pages of the book, guiding readers in using Ignatian spirituality to contemplate the spiritual dimensions of the transitions of later life — retirement, empty nests, caregiving, losses, illness, death. The exercises are practical and direct and are intended to be a resource to help readers make the often tough decisions they confront. But they also help open readers to the wonders of the new realities they face in their lives. The book isn’t a treatise on the Spiritual Exercises. Rather, Lee calls it a “bottom up” resource that focuses first on the issues unique to older people and then applies the Exercises to deal with those issues. Lee reflects that “more of my life is behind me than ahead,” placing her closer to the issues she addresses in the fifth and final chapter of the book. “But for those of us in that situation, it’s important to strike a balance, to live in the present and see the graces of the past,” she says. Indeed. She continues to serve the New York chapter of IVC, assisting the organization in everything, from fundraising to recruiting volunteers and service agency partners. “See how the Holy Spiritual finds new ways to use people’s skills once we say, ‘I am open to what you’re asking of me God’? I am eager,” she marvels. Barbara Lee’s book is available on Amazon.com in paperback and Kindle versions. IVC New York Region is sponsoring a book launch event April 4 in New York City. If you purchase the book from Amazon, don’t forget to order through Smile.Amazon.Com and to designate IVC as your charity of choice. Congratulations Barbara. I’ve always been impressed with your dedication and many contributions to the IVC community. I am looking forward to reading your book.